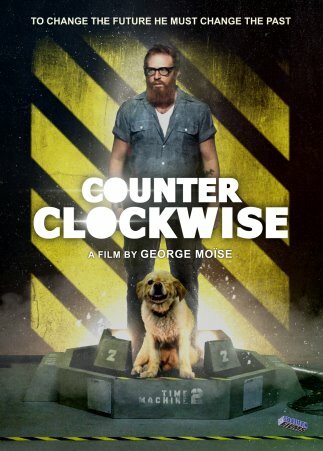 Counter Clockwise (directed by George Moise) is not really a horror film, instead it is more of a sci-fi dark comedy thriller. however ever since I saw the trailer back in June I had been hoping I would get the opportunity to view it. This is because the film is all about time travel which just so happens to be one of my very favourite concepts. I always feel that time travel stories should be cautionary in nature (such as The Butterfly Effect) and that if you are going to make a film about the subject it should be utilised to it's full potential (unlike the very disappointing Looper). Thankfully Counter Clockwise makes great use of the idea of time travel in what is a thrilling and quite tense adventure. This is despite an obviously limited budget which can be seen in sparse set dressing and in the actual events that occur, but by this limitation something special was made as the film becomes much more personal and driven as a result. Holding the film together is Kopelow (who also helped to write the plot), his character is not the normal hero type, instead he is a flustered every-man, rushing around desperately trying to fix the mess he is in but unwittingly causing it as he does so. He has no combat abilities, in fact he spends a heck of a lot of time running away from pursuers, his only real power is knowing what the future holds and using that to his advantage. Aside from one character whose heel turn was a bit hammy the supporting actors were all impressive, of note especially was Frank Simms as Roman who stole every scene he was in, and Bruno Amato as Hank who provided the most blackly comic part of the whole movie; he had the best lines basically. The plot is quite clever and brain melting, something that I was very pleased to see. There is lots of foreshadowing for later events that tell the viewer implicitly what is going to occur, such as in the future a man questions Ethan as to why he never showed up to a meeting they had arranged, When later in the film Ethan in the past arranges this self same meeting you just know something bad is going to happen. There are many moments when Ethan encounters his past and future selves, some scenes are pretty clever with this aspect, again setting up events for later on in the plot. The main point that Counter Clockwise seems to be inferring is that you just cannot escape your destiny, no matter what you know there is just no way to change things. It made be a bit irritated at times that Ethan would do things that he must have known would not change anything, yet on he goes pretty much taking cues from what happens to him rather than trying to actually make a difference. I loved that due to the murders taking place the same day he invented his machine he was unable to go back far enough in time to really be able to make an impact, five hours or so is all the head start he can get. There is a resolution of sorts, albeit in a Twelve Monkeys type way but it all ends on a frustratingly obtuse note that felt to me like a bit of the film was missing. Leaving it up to the viewers interpretation is never a bad way to do things I guess but for me I wanted more of some kind of resolution, especially as I couldn't for the life of me think of much of a solution! The directing is good, there is clever use of close ups and scenery shots to really play with expectations. One scene for example has the camera rush up to a character as if it is the POV of an attacker only to then just be a red herring. In another scene when Ethan is trying to explain his time travel story for yet another time the audio fades out and we get the sound of traffic instead of hearing what he says, this was a great scene, especially with all his gesticulations. Some camera shots almost become art house in style, while a few of the chase scenes brought to mind the classic Crank in it's crazy use of sweeping angles. Also of note were the charming retro computer graphics sequences, I loved the look of these, this time making me think of the video game Another World. The score compliments the manic pace of the film very well, at times it sounds almost like a ticking clock with the beats it runs. I adore time travel films done well and Counter Clockwise shines in so many regards. The sparse sets bring focus more onto the actual events going on, the acting is for the most part excellent, and the story makes great use of the core concept. I just wish there had been more clues as to the overall fate of all the characters as I was left wanting more, regardless this is a fantastic time travel film and will be sure to get your brain hurting. I have thought about this film quite a bit since watching it yesterday so that was a bonus I didn't consider when writing this review in draft on Thursday. Counter Clockwise comes out on DVD/Blu-Ray and VOD/streaming services on 13th December thanks to Artsploitation Films.